We held # 688 regular meeting, which was the first meeting in the new fiscal year, on April 6 at Yokohama-shi Kaikou Kinen Kaikan 2F #7. The theme this time is “Self-confident”. I was nervous because it was my first TMOD. Especially there was a change in some role taker assignments in the last minute so, I needed a little effort. But I was able to successfully complete the preparation in advance. Thank you for your cooperation. We had an award presentation of ALB, ACB, and Pathways Level 1 graduates in business sessions. Congratulations to the winners. Today’s table topic session theme is related to the new era name “Reiwa”. Seven people made wonderful speeches for each various questions related to the theme. Today, we had five prepared speakers. Ice Breaker speeches by three rookies were especially very unique. TM M O introduced her nickname’s history, TM K O talked his adventurous career, and TM S K spoke about his favorite country. Each story represented their personality. The general evaluator was Mr. K N, it is the first time for her to take the role. I think her polite and considerate progress was great however her self-assessment was 50 out of 100. Each evaluator also commented on time and was excellent feedback to the speaker. Today’s best-prepared speaker was newcomer TM M O. Congratulations! I was a clumsy TMOD, but I’ve done. I really appreciated everyone. The first session was a special session controlled by Toastmaster O who is Club Growth Director of District 76. It was “Lie spotting game.” Participants were separated by 4 to 5 people and made 1 untrue and 4 true short self-introductions. Other members need to make wiser questions to spot a lie in limited time. The nervous atmosphere was totally disappeared by this ice-breaking session. Table Topic: The second session was a Table Topic session. This session is normally going through one topic, but since this meeting was a joint meeting, there were two topics that were made by each club. The topic from Yokohama TM Club was “Explain how to cook it” made by TM A. The other topic from Visionaries Toast Masters was “How to survive in IT society” made by TM K. Table topic session is difficult for everybody but experienced TM S made a great speech in such a short time and was chosen as best table topic speaker. Prepared Speech: The third session was prepared speech. Each club members prepared two speeches. Speech titles were: “Are we ready for Multicultural Society?” TM U from Visionaries TM, “Live like water,” TM S from Yokohama TM, Be a leader of your life” TM T from Visionaries TM and “International Marketing” TM O from Yokohama TM. Since this meeting was a joint meeting, all speeches were well-prepared and great speeches. TM T from Visionaries TM was chosen as the best prepared speaker. It reminded us the importance of decision making in daily life. Evaluation session: The fourth session was Evaluation session. Each club members evaluated other club members’ speech. TM O from Visionaries TM was chosen as the Best Evaluator. Of course, evaluation itself was great, but his powerful voice and gestures from his big body were amazing! This meeting was the last meeting for me, but I really appreciate for giving me a chance to be a Toast Master of the day or moderator of the joint meeting. 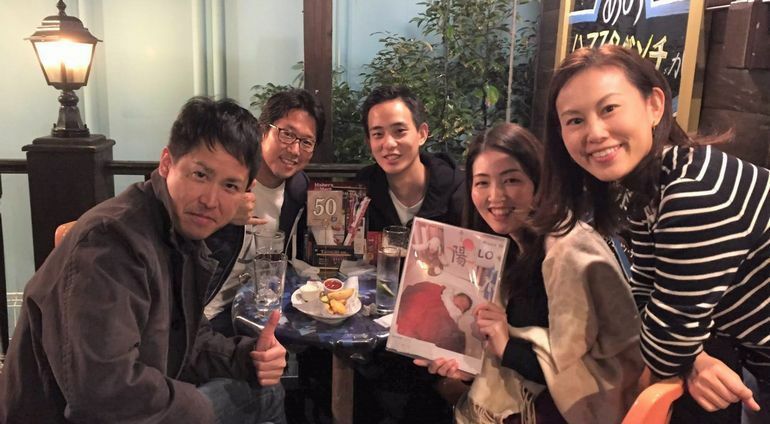 Our 685th regular meeting was held at Sakuragi-cho Pic City on Feb.16th. On that day, we had a rich content meeting, such as Joke session, Workshop, Table topic session, and Prepared speech etc. We really enjoyed them. The meeting theme of this meeting was ‘sweets’. We had Valentin’s Day this week, so I collected the answers to the role takers’ favorite sweets and shared them. Sweets make us relaxed when we have a busy time or stressful time. In this meeting, we found the new aspect of members favorite. Yokohama Toastmasters members have a very sweet tooth. Joke Master H ’s character. Next is the Workshop which was given by immediate past President T about YTMC officers and election. We could learn about each officers’ role and how YTMC is being run. It was very understandable to new members. Next is the Table Topic session. Table Topic session was very interesting thanks to Table Topic Master I’ s novel idea. By all members who answered to Table Topic Master I’s question, Masterpiece story was made. Next is the Prepared Speech session, all members were waiting for. Each speech was very interesting. Each of them was well researched and easy to understand. The audience was attracted by the speakers. Good job and thank you, Prepared Speakers! The last is the Evaluation session. This time is not only the evaluation for prepared speech but also the evaluation for the evaluation of the prepared speech. Each evaluator gave shrewd advice and we could find some improvements which we didn’t know by ourselves. At last, the experienced today’s GE gave us advice throughout the whole meeting that will be of some help a lot. We held an in-club speech contest once a year on February 2. 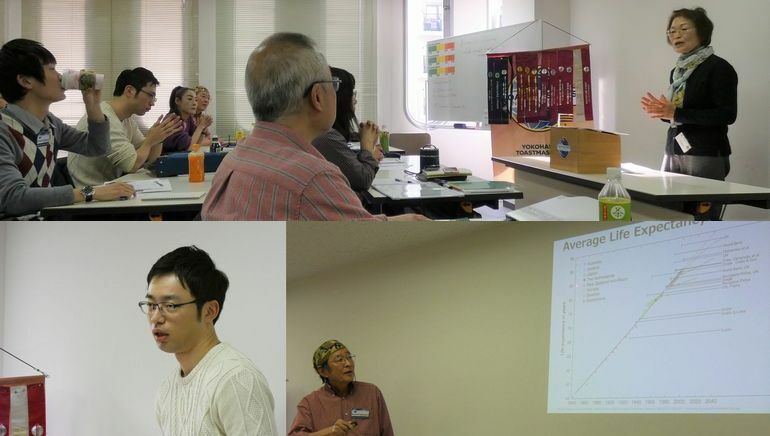 Yokohama Toastmasters Club is an English speech club usually, but we also did Japanese speech for the speech contest. 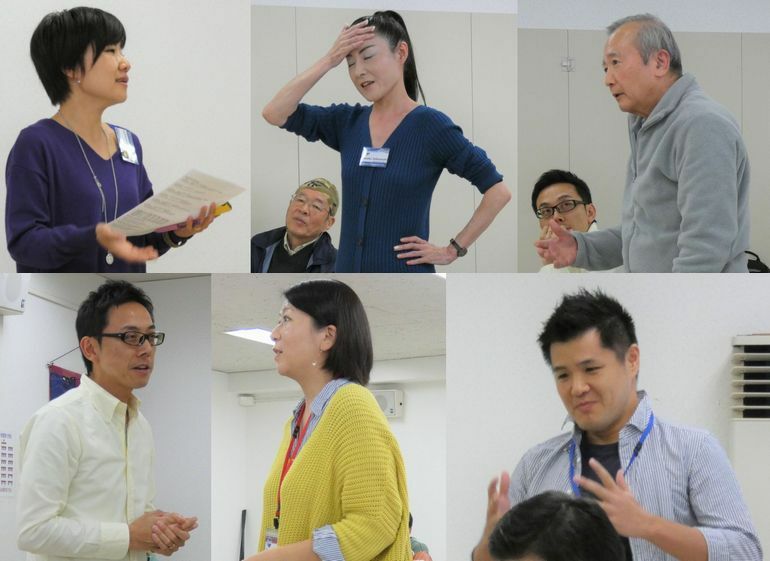 We had five English speakers and five Japanese speakers as contestants, and they showed off the speech ability trained through regular meetings. In English speech contest, Mr. K spoke about the advice of his boss concerned with the attitude of work, Mr. O spoke about how to overcome the pinch, Mr. I spoke about the importance of resetting feelings, Mr. F spoke about importance of “want to do” more than “have to do” and Mr. K spoke about his memory with college friends. All the speeches were wonderful! In Japanese speech contest, Mr. K spoke about attitude to doing something kind for another person, Ms. T spoke about her experience of a pregnant, Mr. F spoke about the importance of acting for others beyond his own frame, Mr. K spoke about what we should do when we become customers, Ms. A spoke about the importance of thinking about people’s mind. Japanese speeches were also wonderful. They were great! Judges of contests were the person who selected from among our club members. Of course, speakers did not know who the judges were. The venue was surrounded by tension during the appraisal. Interviews with the speakers took place until the judgment result appeared. Mr. O and Mr. K in the interview called the laughter of the audience with pointed questions. As a result of the examination, contest chair Mr. M announced the winners from the speakers of English and Japanese respectively. The 1st and 2nd speakers will participate in the area contest to be held on March 3rd. 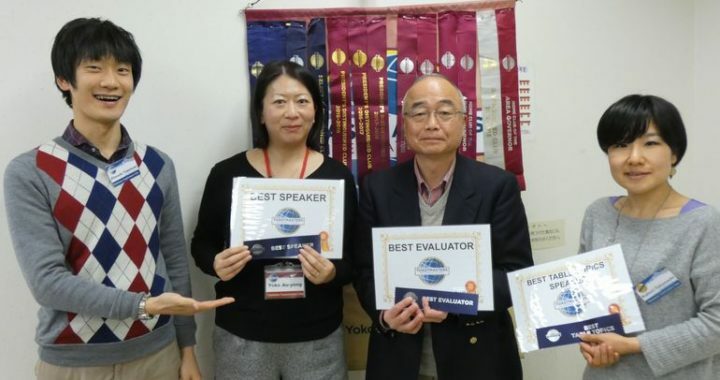 A speaker participating in the World Competition from Yokohama Toastmasters Club may come up. Everyone participating in the area contest, please do its best. Well, do not you all have a great weekend with listening to many wonderful speeches? You are welcome to visit the club anytime! Our 683th regular meeting was held at Hiranuma Memorial Rest House 2F on Jan.19th. We had 30min Table Topics session and 3 prepared speakers at this meeting. It was simple, but we had a very good time. I set “Contest” as our meeting theme because we hold In-house contest after 2weeks. Experienced members had various experience through Toastmasters Contest. For example, TM T S won 3rd place at District Contest which is a nationwide in Japan about 10 years ago. TM R K conducted District contest as a steering committee member in 2015. Besides, many members participate in In-house Contest every year. I felt that members who are positive for the contest get together at our club!! With regard to educational program, Table Topics master TM R K assigned 8 members as a speaker. He prepared a various type of questions and some were difficult. But All speakers managed to give their speech for about 2min. 3 prepared speeches were great individuality. Their speeches were created based on their own experience. That’s why those captured the audience. Today all evaluators were very experienced members. 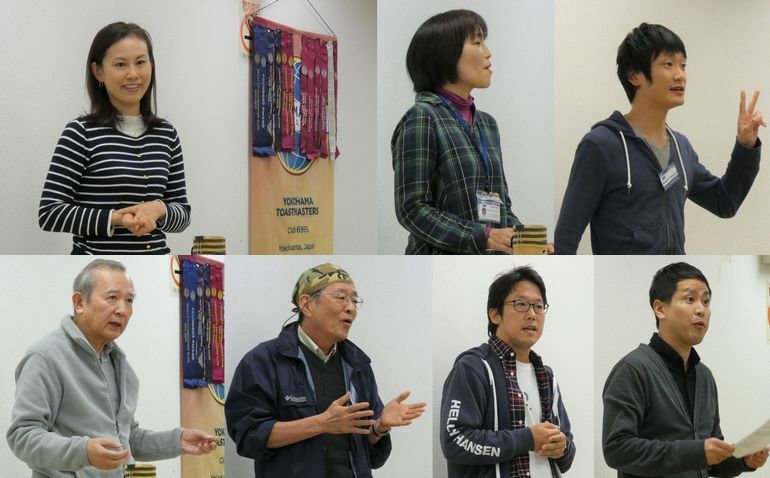 They have been joining Toastmasters for more than 15 years. Their evaluations were well organized and critical. We could learn a lot from them. Next meeting is In-house Contest!. Why don’t you listen to great speeches? We always welcome your participation!! The first meeting in 2019 was held on Jan.05 at Hatoba Kaikan. The meeting theme was “New Year’s Resolution” which was a mediocre theme in this season, but I was impressed with the answers, as the most of the theme related answers from role takers were serious, meaningful, and interesting ones. Unfortunately, one speech was canceled due to the speaker’s sudden illness, but his evaluator kindly accepted the Agenda Timer’s role. Joke speech was interesting and funny. Table Topic moderator asked well-selected questions covering broad areas. 3 prepared speeches were based on Pathways, and they were very well done. They were relatively serious and impressive ones. Each evaluator gave serious evaluations of the corresponding speech. Each speech was evaluated very well, and Evaluation session was done smoothly and successfully. Overall, the meeting was done smoothly. However, I had some difficulties with the preparation for the meeting as a TMOD. First, I need to apologize that all member address I used was not effective today at all, and it caused the whole process delayed. Also, it caused many inconveniences in the year-end season. Also, I confess it is difficult to get all confirmations, all answers to theme related questions, speech information in this vacation season. YTMC Meeting No.680 was so Enjoyable. Word of the day was “illustrious”. Intonation was a little bit difficult but useful. TM T leaded meaningful workshop “Mentoring”. We could realize how “Mentoring ” was so important for new members. Dec.1st was The Day of Movie. So we enjoyed table topics for about movies. Speech session had 3 speakers. Best Table Topic Speaker was TM M.
Best Evaluator was TM O. They said enjoyed meeting and want to watch and learn more about movies. All of the attendees, thank you very much for your support. Member’s Favorite Movies as following. Let’s watch them in year-end holidays. The 679th Meeting was held on November 17 at the Hiranuma Memorial Rest House the same place as the last meeting. A Speech evaluator was absent in the morning. We need a substitute, but we were able to get it with teamwork. I felt that communication from every day will be useful in case of emergency. Before the regular meeting, “Business English consultation meeting” was held. We were able to share valuable information that can’t get from a book from experience of an overseas resident. At the beginning of the meeting, We had a club awards ceremony, We Yokohama Toastmasters Club were awarded a valuable award “President Distinguished Club”. It was given only to the top 10%. Last president TM.T was presented with a commendation ribbon, and a new history has been added to our club, which celebrated its 30th-anniversary last year. In the meeting, TM.I introduced “Today’s word”. Today’s word is “Leave”. “Leave” has many meanings and uses. Please use it a lot. Next, the meeting theme. Today’s theme is “Autumn Leave” (KO-YO), where is the recommended place for seeing Autumn leaves? It’s same as the word of today! I introduced recommended some spots from everyone. In the end, TM.N was recommended sweet potato. It is delicious. After explaining each role, “Joke Session”. TM. N gave a joke speech fluency. It is very difficult to take a laugh in English, but surely, she took a laugh. In “Table Topic session”, TM.S conducted. This session was unique to explain celebrities chosen from the basket. Everyone enjoyed it in a unique way. Two guests also enjoyed very well. The venue was very excited. Today’s “Speech Session” is 4 people. TM. S gave a speech that significance to protect coral reefs. The speech was a long speech with Q&A and response and 15-minutes long speech completed. The next Speaker is TM.K. Today was his birthday, so it was a memorial speech. TM. K isn’t good at preparing in advance. Today he didn’t prepare anything to dare, and he did his best speech as he can. Next is TM.A. In association with the scent of “KINMOKUSEI”, she gave a speech about bitter memories in her school days. Everyone was impressed by her powerful speech. Finally TM. O He is going to participate in the Kanagawa -ken rookie competition held in this December. His speech was a preparation for the competition. So, He gave a serious speech just like a real contest. After the break, “Evaluate Session” conducted by general evaluator TM.O. Each evaluator was an experienced person and gave an accurate evaluation of each speech. Especially it was very impressive that TM. A gave a hard evaluation in order to get a successful speech in competition. Following the report from each role, the meeting progressed the final stage. We had the award session. The best table topic speaker was TM.O. The best evaluator were two persons TM. A and TM.M and the same point. The best speaker was TM.O. Congratulations! This was the first TMOD. I was worried that I could control the meeting, but I managed to conduct it on schedule through the strict control of Agenda Timer by TM.T. Thank you. 678th regular meeting was held at Hiranuma Kinen Rest House which is located nearby to Yokohama Bunka Taiiku-kan and having a meeting at this venue seems to be for tor the first time. Both facilities, which are not so new at all, make us feel something as if we were back to Showa era. At the beginning of a meeting preparation, I had to seek one speech evaluator out of six speech evaluators and thankfully a voluntary candidate was offered immediately by some members. This admirable assistance made me feel confident and ease of keeping on my duties. The short of role takers also required an assist from other club members and we asked one person for a timekeeper accordingly. Before the regular meeting, a one-hour ad-hoc meeting was offered and conducted by Toastmaster A for a free-discussion relating to English learning tips. Many discretional participants seem to have been enjoying the meeting. I bet many members look forward to joining the 2nd round of the meeting before the next-next regular meeting. 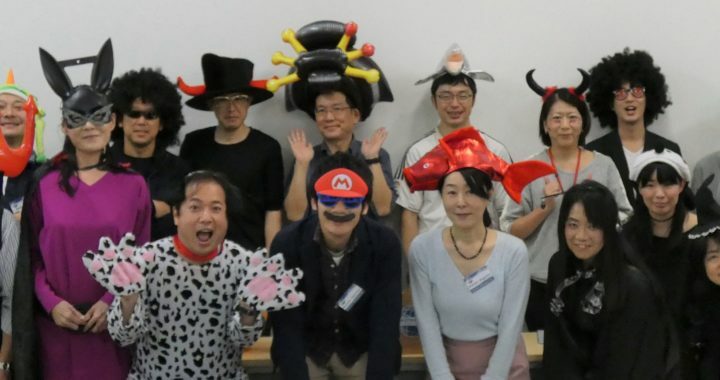 It was Culture Day so to facilitate choosing a meeting theme, “Culture Shock” In the opening, I talked about my experience what I was amazed in Osaka. Despite it was one of my original favorite fake stories (I have ever talked it to Toastmaster N personally before) and I had been assured to make the audience feel extremely funny (surely telling them it was a fake story), it was not so successful in fact. In my view, I found I had some issues on it: the content made fun of Osaka people slightly; some expressions might be substituted with other effective ones to make the story more attractive; failed to speak smoothly in the most important part to make my audience laugh. Word-of-the-day by Toastmaster K was, “Note” He gave us a word we could use relatively easily in verb or noun when we delivered a speech or spoke something in the meeting. After having a role explanation by respective role takers, as usual, Toastmaster T as a Table Topic Master conducted a table topic session. Every topic she put forward were based on or referred to mentee or mentor in Toastmasters e.g. “What will you advise to your mentee?” or “What kind of advice have you ever received from your mentor?” She gave us an opportunity to remind ourselves an important function in Toastmasters we tend to forget occasionally. We had 6 speakers in the prepared speech session. “Will AI replace teachers” by Toastmaster H, who is a junior high school English teacher, was a timely topic and her honest thoughts gave us something to consider a lot. I suppose she received many valuable feedbacks from the audience. “Early Bird” by Toastmaster N is a story about herself who enjoys getting up early in the morning. We may have something lucky if we do the same. 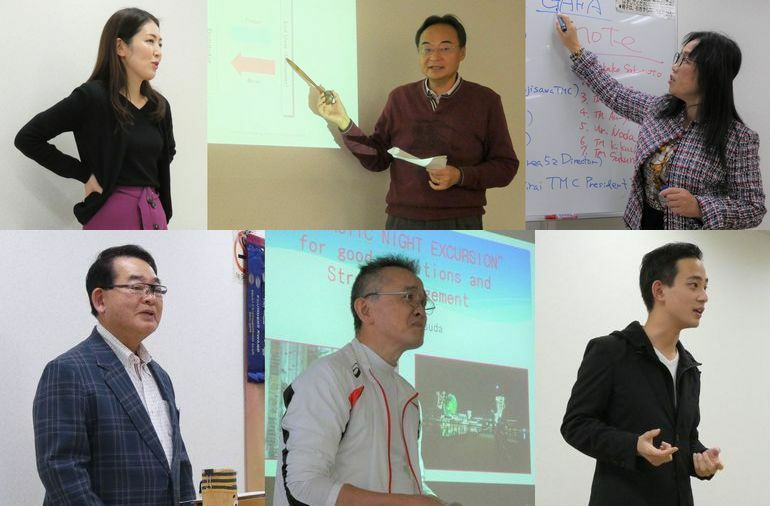 “Marketing in Japan” by Toastmaster O, who joined the club just a few months ago, illustrated a world trading business with overhead projector briefly based on his current business. His speech looked confident enough despite it was only his 2nd-time speech. “Initiation to the fishery Industry” by Toastmaster T, who joined the club recently and it was his 1st-time speech, was his self-introduction along with his long journey with the fishery industry. Because of his extensive experience including his expatriate life several times, I felt as if I was watching a spectacular pageant. ”Runtastic-Night Excursion” by Toastmaster M was about a useful app on running along with his Yokohama night excursion on running one day by demonstrating with an overhead projector. I bet nightclub enthusiasts also enjoyed his speech. ”My Communication Style” by Toastmaster H revealed something about the well-determined speeches he delivered consistently. The evaluation session was conducted by a general evaluator, Toastmaster A. We had 6 individual evaluators for each speech. All the evaluators today were an experienced member or a member who are just back from the USA after an expatriate so that we had a good opportunity to learn fruitful evaluations. The best table topic speaker was awarded to Toastmaster As (a guest from Zama Toastmaster club? 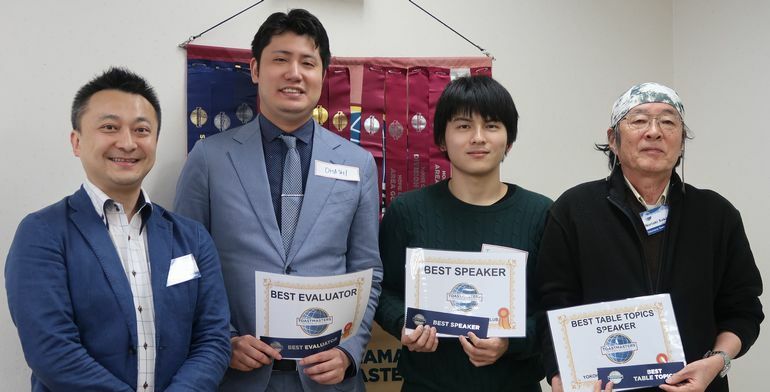 ), the best evaluator was awarded to Toastmaster SN, and the best-prepared speaker was awarded to Toastmaster M.
Regular meeting #677 was close to Halloween. According to the president’s request, all members wore a costume. I dressed up as a devil. The meeting venue was different from the regular one, and right next to the pub where we also have regular off-site meetings. The meeting theme was “Trick or Treat”. I talked my first experience of Halloween in North America for the opening. “Trick or Treat” is the only for safe residence area. There always are some bad people as every country does. The sweets giving away to children used to be a candy apple. Those bad people hid a needle in a candy apple so that nowadays, we cannot eat a sweet provided by strangers anymore. That’s sad though. More and more Halloween custom has been becoming widespread in Japan. But it is mostly like a costume parade event just to have fun. You can see the products related to Halloween in the season on a front shelf everywhere. The Halloween is becoming more commercial as well as North America. Anyway, the meeting starting with a costume. Toastmaster T.S raised horrified” for the word of the day which fit Halloween-like. “Horror” and “Horrify” are another word class for “Horrified” meaning scary but it can be used for surprised in some context. Joke master was Toastmaster O who has a high hope in our club. Telling joke is quite difficult for Japanese, but he did a really good job with three jokes. Table topic master was Toastmaster N who also is a promising new member. The theme was ” How do you answer the question regarding Japan when you’re asked by Americans”. It was a good theme since lots of Japanese have an experience being asked regarding Japanese culture, custom and history by non-Japanese. Japanese needs to prepare to answer those type of questions because the world is becoming more and more globalized recently. The questions were simple but difficult to answer. The table topic session was very interesting. and learned lots of thing about Parkinson’s disease. Today’s general evaluator is Toastmaster M with four evaluators for each speech. Evaluators gave good points and some advice to speakers. We had a photo time wearing a costume at the end of the meeting. I was thinking the president dressed up as a cow but actually, he was a dog of “One Hundred and One Dalmatians”. Sorry! !